Recorded history tells us that “Constituted” Freemasonry began in London England, in the year 1717 when the first Grand Lodge of England was formed. In North America it began in 1730 when Colonel Daniel Coxe was appointed Provincial Grand Master of the English Province at which at that time included the colonies of New York, New Jersey and Pennsylvania. The Most ancient and Honorable Fraternity of Free and Accepted Masons was established in what is now New York State during the Revolutionary War on September 5, 1781. At that time a Grand Charter was issued by the Atholl Grand Lodge of England, and under the provisions of this Charter our own Grand Lodge declared independence from the Grand Lodge of England and continued its constitution by a Resolution adopted June 6, 1787 as the Grand Lodge of New York F. & A. M.
On November 24, 1866, twenty men met in Riverhead and agreed to contribute $260, “for the purpose of starting and furnishing Ocean Lodge of this place with necessary equipment for carrying on the work of the same”. However only 18 of these men became members of Riverhead Lodge and they contributed a total of $230 for the purpose mentioned above. The names of these are as follows: N. S. Woodhull, B. V. Chase, E. F. Squires, E. H. Ryder, John E. Carter, William Baird, G. I. Benjamin, John H. Phillips, Alonzo F. Vail, Wesley Fanning, Perry Wines, George P. Carter, David A. Vail, and Phineas W. Tuthill, all of whom were charter members of the Lodge. Four other contributed and became members of the lodge as follows: J.T. Fielder, George Stern, Charles Hallett and Charles L. Corwin. The name Ocean Lodge was soon laid aside, for on March 2, 1867, at the first meeting of the Lodge under Dispensation (UD) it was called Riverhead Lodge. Nelson W. Woodhull was Master, Brewster V. Chase, Sr. Warden, and David A. Vail, Jr. Warden. The Master appointed Wesley Fanning, Secretary; B. V. Chase, Treasurer; E. F. Squires, Sr. Deacon; George Benjamin, Jr. Deacon; John Phillips, Tiler; Perry Vines and John C. Tyler, Masters of Ceremony, and George Carter, Musician. E.F. Squires, William Baird and Phineas Tuthill were appointed Trustees. The first meeting was held in a small wooden building located in the back of a store of Jacob Meyer on what is now known as the Benjamin Place. Bare and unpainted walls, hard chairs, and uncarpeted floor and a plain altar comprised the setting surrounding the birth of this Lodge. In these humble surroundings was founded a Lodge, a Masonic edifice, which for 144 years has yielded a power for good within and without its jurisdiction. On May 11, 1867, the Lodge held its last communication under dispensation. The minutes show that on that evening the Fellowcraft Degree was conferred and that a communication was received from the District Deputy Grand Master. What this communication contained is not recorded, but likely it was in reference to the possible receipt of a Charter from Grand Lodge. At the 13th communication of the Lodge held on July 27, 1867, Bro. Brewster V. Chase, Sr. Warden, acting as Master, read the contents of the Charter for Riverhead Lodge #645 to the brethren present. It was dated July 15, and signed by Most Worshipful Stephen H. Johnson, Grand Master, and by Right Worshipful James M. Austin, Grand Secretary. It is interesting to note here that Riverhead Lodge was the sixth lodge to be chartered in what is now Suffolk District, Suffolk # 60 (# 401 at the time), Peconic # 349, Womponamon # 437, South Side # 493 and Jeptha # 494 had already been chartered, Suffolk # 60 as early as 1796. 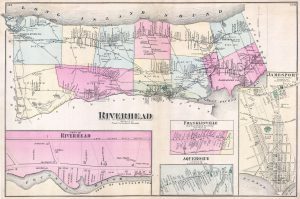 At that time Riverhead Lodge was a part of District # 4, comprising all of Suffolk, Kings and Queens Counties, and according to the report of R:.W:. John K. Oakley, D.D.G.M., recorded in the proceedings of Grand Lodge as of June 4, 1867; there were 40 chartered lodges and 9 under dispensation in the district. At the time of this report Riverhead Lodge was still under dispensation. In his report the District Deputy also said, “The Fourth Masonic District, as now constituted, embraces a large territory and a great many Lodge. I would therefore, respectfully suggest that the county of Kings be constituted the 4th Masonic District; and also that the Counties of Queens and Suffolk be constituted the 26th Masonic District, in order that the labor attending the position of D.D.G.M. be equalized, and the Craft be benefited.” The same suggestion was made by the District Deputy the following year, and in the year 1868-1869 Kings County became District 4, and Suffolk and Queens District 24. Exactly when Suffolk and Queens became known as District #1 your historian did not make time to determine. However, with the formation of Nassau County and the increase in the number of Lodges in the total area, the Districts were given names, and in 1922 Suffolk became one of those Districts. Today the area of Suffolk, Kings and Queens of 1867 contains eight Districts and ~153 Lodges. Suffolk District contains 16 Lodges as compared with six of 144 years ago. Still thinking in terms of size and numbers, Riverhead Lodge reported a membership of 30 at the end of 1867, and today is over 325. More than 1,050 men have either received the degrees of Masonry in Riverhead Lodge or have become members by affiliation since 1867. When a new Lodge of constituted, those who are the charter members must have received the degrees of Masonry in another Lodge, and according to the old Register of Riverhead Lodge eleven of the 14 charter members received the three degrees of Masonry in Peconic Lodge #349, which shows clearly why Riverhead Lodge has always regarded Peconic as the Mother Lodge. In 1926 Riverhead Lodge had an opportunity to pass this favor on when Potunk Lodge was formed. 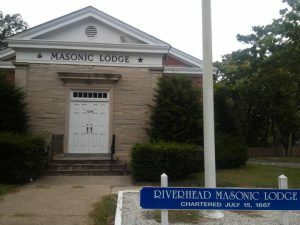 The record shows that on June 22, 1926, more than 20 members of Riverhead Lodge become charter members of Potunk Lodge # 1071. 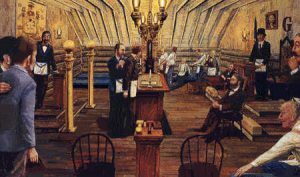 The first meetings of the Lodge were held on Saturday evening, but on August 10, 1867, the meeting night was changed to Tuesday, and this custom prevails to the current time. Dues were $3.00 per year, Initiation fee $25.00, and the affiliation fee $10.00. Several noteworthy meetings of the Lodge held for special purposes should be mentioned in this brief history. The first was a meeting on Monday evening, December 30, 1867 at 7:30 for the public Installation of officers. A copy of the program is preserved with the minutes, and this shows that Dr. & Wor. W. C. Bennett of Continental Lodge # 287 installed the officers with the assistance of Wor. Bro. Seaman of Morton Lodge # 63, acting as Marshall. An oration was given by Rev. Bro. Stephen H. Tyng, Jr. of New York City; Music was furnished by the Riverhead Philharmonic Society and Miss Julia E. Bowditch of Shelter Island who sang three solos. According to the minutes as recorded by Bro. O. B. Ackerly, Secretary, this was an outstanding evening for Riverhead Lodge both in honor and inspiration. Another outstanding event grew out of a letter from Wor. Bro. 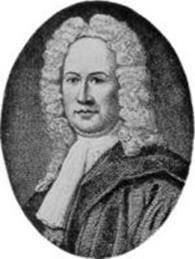 Bennett of Continental Lodge. The letter was received on February 11, 1868, and contained and offer to confer the Eastern Star Degree upon “the members of this Lodge together with their wives, daughters and sisters.” It was not until 1907 that Riverside Chapter #399, O.E. S. was organized. On December 20, 1902, Riverhead Lodge held its 1000th communication, and a special public celebration of this event was held on February 12, 1903. Bro. Charles H. Howell and George F. Stackpole played prominent parts in the ceremony. In January 1924 and outstanding event was a visit to out Lodge of the Grand Master, Most Worshipful Arthur M. Thompkins. This meeting was held in the auditorium on Roanoke Avenue and was preceded by a parade of over 700 of our brethren. It was considered one of the greatest Masonic events of Eastern Long Island and one of the highest honors ever to come to our Lodge, up to that time. The meeting place of the Lodge was a matter of concern from the beginning, for as early as 1870 different committees were appointed to secure a new meeting room. Several ideas were presented, one of them being the addition of another floor to the Courthouse at a total cost of $2,160.00. This old Court House occupied the site of the present store of Perkins and Co. on Main St. Also, the second floor of a store owned by Charles L. Corwin, just west of the Old Courthouse was suggested. Neither of these was chosen however, and on December 19, 1871 the Lodge moved to new quarters in the recently completed Odd Fellows Hall on the corner of Main Street and Griffing Avenue. There was a public meeting at the Courthouse, followed by the dedication ceremony at the Lodge room, conducted by Wor. N. S. Woodhull. 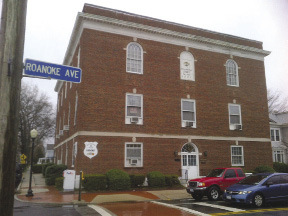 On May 2, 1893 the Lodge held its first communication in other newer rooms on the third floor of the new Suffolk County National Bank Building on Main St. Those rooms were dedicated on December 26, 1893 with the Right Worshipful William I. Chalmers officiating. 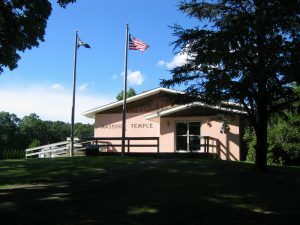 The Lodge continued to meet here for 64 years until September 3, 1957 when the first communication was held in the present Temple on Roanoke Avenue. The cornerstone was laid and the Temple dedicated on October 9, 1957. Most Worshipful Nathan Turk, Grand Master officiated at both ceremonies and was assisted by other Grand Lodge Officers and members of this Lodge. This new home for the Lodge was made possible through the gift of Bro. Henry W. Donald and Mrs. Donald. On September 24, 1931, they gave the Lodge and Riverside Chapter identical gifts in value, which were combined to build a Masonic Temple. During the Centennial Year other events took place. 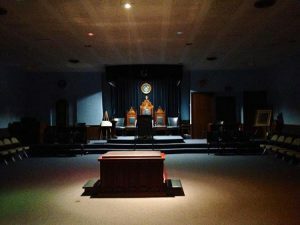 A notable one was on March 5, 1967, the Lodge held a Vesper Service in the Temple when Most Worshipful Raymond C. Ellis, Past Grand Master addressed over 250 who had gathered for the event. 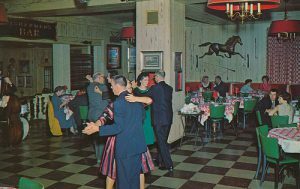 Another important evening was October 28, 1967 when the Lodge held a Centennial Dinner Dance at the Perkins Inn. From the very beginning the members of Riverhead Lodge have responded liberally to various calls for charity from among the brethren and the various community organizations, and are proud of their support of the several Brotherhood Fund campaigns conducted by Grand Lodge. There is always a certain reluctance on the part of Masons to reveal the good works done by them, and it is outside the Lodge and the record of the minutes that the story of Masonry is told. Masons have been prominent in the Community, State and Nation for many years. An examination of the roster of Riverhead Lodge would reveal that men of all walks of life and of almost any profession have been influential as Masons and as men in the community. Two of these men will be mentioned here, although there were many others. The first was R:. W:. William I. Chalmers, a minister of the Gospel. He served is Lodge as Master ten different years, was District Deputy Grand Master and also Grand Chaplin one year. The second was R:. W:. Laurence C. Scudder, who was raised in Alcyone Lodge in 1928, District Deputy Grand Master in 1930, was appointed to the Board of Custodians in 1934 and served as Chairman of that committee from 1941 until May 3, 1967 when he passed to his eternal keeping while attending the communication of Grand Lodge. Through the inspiration found in the lives of men like these and others, Lodge members will continue to search for ways to use the tools of the Medieval Mason, the square, compass, trowel and maul, not as they used them to build cathedrals for the Glory of God, but rather allegorically, for the enrichment of life in the service of God through Brotherly love.